THE STORY It's that special time of year when Sugar Maple Trees run sweet sap that we collect, then take to the Sugar Shack where the sap is boiled down and made into various sweet products such as sugar crystals, candy and syrup. Ours is a small operation involving such risks as bad weather, while the large Sugaring Operations don't use tree taps and pails, but instead run tubing for less risk. Big or small, that first taste of sweetness is heaven in your mouth. 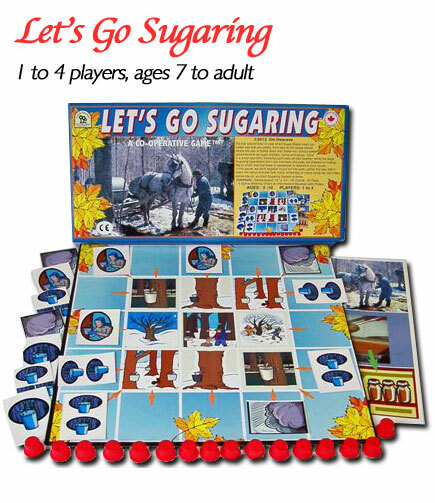 In this game, we work together to put out the pails, gather the sap, boil it down into syrup and see how many containers of maple syrup we can make before the oh, so short Sugaring Season is done.